Superbly located just off the N40 South Ring Road. Just 5.5km from Cork City Centre and within 8km of Cork International Airport. Excellent transport links immediately adjacent with direct access to the South Ring Road (N40). The site extends to approximately 6.43 hectares (15.9 acres). Entire site zoned &quot;Existing Built Up Area&quot; and suitable for a variety of uses including mixed-use, residential, office or hotel development. Bishopstown is one of Cork's largest and most affluent suburbs with a population of approximately 25,000 (Census 2016). Located approximately 5.5km south west of Cork City Centre and approximately 8.5km north west of Cork International Airport the site is easily accessible via the N40 South Ring Road. The subject site comprises a greenfield site that extends to approximately 15.9 acres located just off the N40 South Ring Road within close proximity to the Bandon Road Roundabout. 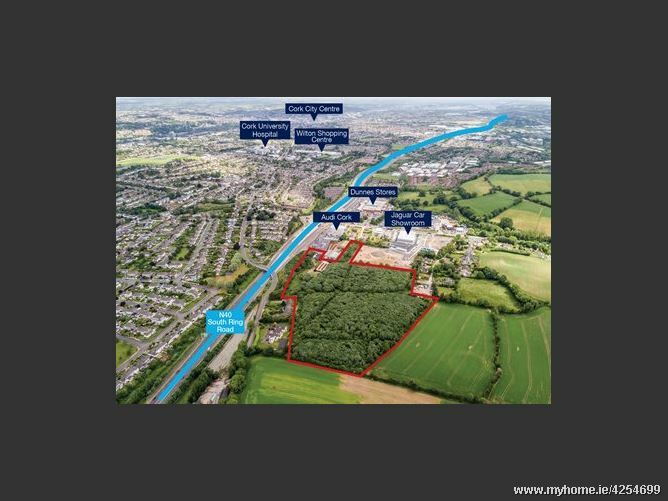 The surrounding area is a mix of residential and commercial in nature with Audi Cork and the new Jaguar Car Showrooms bounding the site to the east while approximately 22 acres of residential zoned land bounds the site to the west. The land immediately adjacent to the south is currently in agricultural use but has been identified in the newly adopted Municipal Local Area Plans (LAP's) as Strategic Land Reserve. Under the Ballincollig/Carrigaline District Local Area Plan 2017 the subject site is zoned &quot;Existing Built Up Area&quot;. The property is being offered for sale by Private Treaty. We understand that mains water and drainage are available however interested parties are required to satisfy themselves on the adequacy and availability of all services to the property.